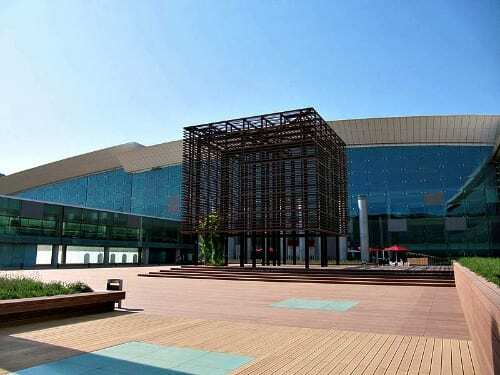 Most travelers coming from North America, or anywhere else not on the continent, will likely arrive at El Prat de Llobregat Airport (BCN) in Barcelona. The airport has two terminals, and generally speaking Terminal 1 (the larger terminal, in photo at right) is home to major international and domestic carriers, while Terminal 2 is home to EasyJet and many of the smaller carriers and seasonal operations. The airport is located eight miles southwest of the city. If you’re planning on a stay in Barcelona before or after your time at TBEX, you can catch the Aerobus into the city. The bus departs on a frequent schedule from each terminal stop (right outside the arrival lobby) and takes about 30 minutes to get into the city center. The price is approximately $7.25 one way, $11.25 round trip (price estimated based on current Euro/Dollar exchange rate). A taxi into the Barcelona City Center will run approximately $37. You can also opt to fly into Girona-Costa Brava Airport (GRO). Ryanair flies into this airport as well as other carriers and charters offering seasonal service. This airport is located a little over seven and a half miles southwest of Girona. You can get into Girona on a Sagales bus. They leave hourly, take about half an hour, and costs about $3. A taxi into the city center will cost approximately $31. If you are in coming into the area via train, you will most likely arrive at Santa Estació (Sants Station), the main rail station in Barcelona. It’s located northwest of the city center in the Sants-Montjuic district. It’s easily accessible from around the city and the airport, and this will be your departure spot for taking the train from Barcelona to Girona. You can purchase tickets in advance online, at automated machines located in the station, or from a teller. Windows 1-10 sell tickets for local trains. If you have questions, there are information booths located by windows 1 and 21. The train will cost approximately $9.50; there is a surcharge for using the teller booths. The end stop on the route is Figueres, so look for that destination when locating your departure track or following the reader board. If you’re starting your train journey at the airport (BCN), your train journey will be slightly different. There is no direct drain from BCN to Girona and you’ll need to make a transfer. You can make a transfer at Sants and then follow the recommendations above. However, the Passeig de Gracia station (the second stop from the airport) is smaller and less crowded and may be less intimidating and confusing. Other stations where you can make a transfer include El Clot-Aragó and Sant Andreu Comta. Once you arrive at the Girona station you can take the #2 bus into the city center. Cost is about $1.50. It’s also walkable, and depending on how many bags you’re traveling shouldn’t take more than 20-30 minutes. You can get information, ticket prices, and find the train schedule here. You can catch a bus from either of the BCN terminals that will take you to Girona. Three buses a day run on this route so you will need to make sure your travel times match up. The bus trip takes about an hour and half at a cost of approximately $27 one way, $49 round trip. Information regarding the bus schedule from Terminal 1, general bus information, and online ticketing is available. Rental cars are available in the usual locations – airports, near train stations, and in various city center locations. Shop for competitive prices and consider booking in advance for deeper discounts. Parking and driving in Girona may be difficult, as it is apt to be in many old, historic cities. A few of the city hotels have parking places for their customers (check with yours); a couple of public parking options include Copa’s Parking , the Devesa area (near the park), and the Palau de Congressos. Do you have any special tips for getting to Girona? Please share them with the comments as we’ll be updating this information and creating a transportation page for easy reference. Photo credit: Airport photo via wikimedia commons, Aitor Agirregabiria photographer. Good tips, especially the bits about T1 and T2, which is more important upon returning than arriving in that they are NOT close to each other. ‘A taxi into the Barcelona City Center will run approximately $37,’ I would say that’s too low. I’ve lived in Barcelona 7 years and always paid much more. Could be anywhere between 35 – 50 euros depending on where you’re going, what day and time it is and how many bags you have. The fastest way to get into Barcelona from the airports, apart from a cab, is the areobus. More frequent than the train, which only goes from T2. Catching the train at Sants: make sure to get there ahead of time to get your tickets. You never know how many people may be waiting in line. I recently almost missed a train there, and had arrived 20 minutes early. Sometimes you can get tickets online ahead of time, other times only two hours ahead of time. It’s a mystery that I have not figured out in all my time here. Usually getting tickets to Girona is not a problem. If you drive from Barcelona plan for tolls or take non-toll roads which are much longer. What is the station for Girona called when you are booking train tickets online? I don’t see anything in the dropdown menu on the website. Good information, but I’m confused about the train from BCN to Sants or Passeig de Gracia to make the transfer to Girona. I can’t see find the schedule for the train from BCN. Thanks. Hi Cathy, The website is confusing and difficult to navigate, but if you go to the drop down menu you can find the departure station of the airport and the arrival station of Sants or Passeig de Gracia. It appears to run very frequently, about every 20 minutes. This information was provided by our hosts, and I don’t have any personal experience to provide more of an update. If you need additional assistance you may want to check with a ticket seller when you arrive.